Montana is a state in the north west part of the US, bordering Canada to the North. It's nicknames are Big Sky Country and The Treasure State. It's motto is Oro y Plata, which is Spanish for Gold and Silver. 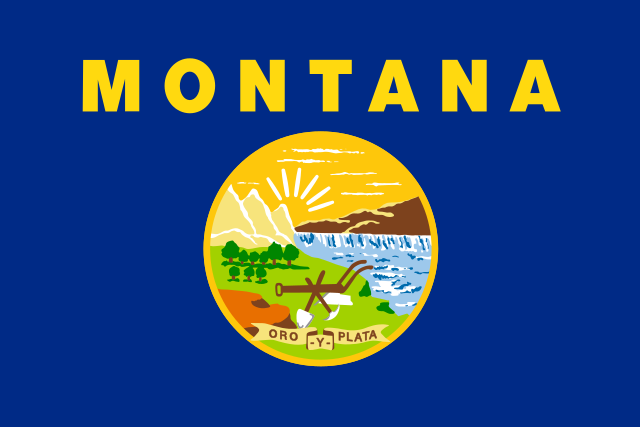 The flag of Montana is a dark blue color with the word MONTANA in yellow, above the state seal. The seal says The Great Seal of the State of Montana and Oro y Plata on it. There are pictures of mountains, plains and forests. It has the Great Falls on the Missouri River, and a plow, pick and shovel. The Great Falls are waterfalls on the Missouri River in Montana. Glacier National Park is a place in Montana with lots of great wildlife and glaciers. About 50 years ago, there was an earthquake in Montana that caused an 80 million ton landslide. The landslide blocked a river, and the earthquake caused cracks in other rocks and dams, and it created a lake which is known as Quake Lake, or Earthquake Lake.